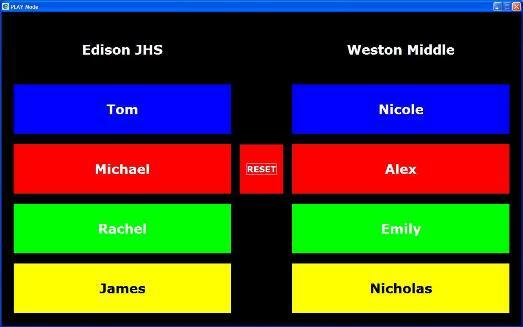 QuizBowl LiteShow supports standard 2-team competition, identifying ring-in winning teams and players whose names you can customize. But wait... QuizBowl LiteShow can also accommodate up to 10 teams or players competing head-to-head. For ring-in devices, you can choose either wireless slammers or wired handheld buzzers. We offer complete systems built around both of these. 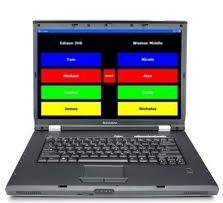 Just plug the system's wireless USB receiver into your computer, customize team and/or player names in the QuizBowl LiteShow software module, and click "Play". When a player rings-in, his/her name is highlighted on-screen while one of two sounds identifies their team (or side). If you have access to an external display, such as large screen TV or a projector, everyone in the room can see whose name comes "up in lights". Do you distribute your question sets electronically? If so, you can load a PDF question set into the software with tabs for "Toss-Ups" and "Bonuses" so that it's easy to transition from one type of question to another. See our QuizBowl LiteShow Add-Ons page for other useful accessories. P.S. Due to its unique ring-in technology, QuizBowl LiteShow can actually be used to compete against other teams over the Internet! You and your opponent meet online using a screen-sharing application like GoToMeeting, and no one has to travel. Apart from your not being in the same room, everything about your quiz bowl match is the same - you use the same buzzers, read the questions the same way, and answer the same way - verbally. Contact us for details on which screen-sharing applications are capable of supporting online competition.